Grrrrrrrrrrr! :blink: I mean: GRRRRRRRRRRRRRR! I'm sorry. That's all I got. I'll take Noir. That's going to be a 7 disc set. EDIT: I can also burn Naruto eps 91 - 174 and the movie "Naruto: The Big Mission to Rescue the Snow Princess"
And the Full Metal Alchemist movie "Conqueror of Shambala"
Nah, no need to send me any dvd's. I've got an assload of them sitting around here. PM an address to send them to and I'll start 'archiving' my originals and shipping them off-site for back-up purposes* this weekend. Eamon Angelface wrote: Is that a mountain dog? My friend just bought one of those I think. Swiss mountain dog or something. He had a hell of a time finding a good breeder. 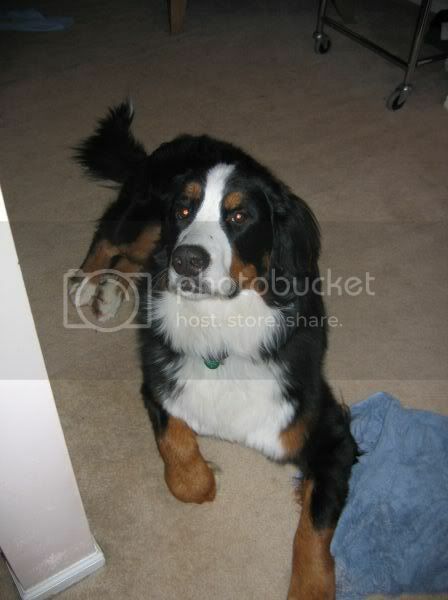 Bernese Mountain Dog. They tend to have a lifespan of between 3-10 years (10 years if you're lucky). Such sweet, sweet, brainless dogs.